경북 울진군 구산리에 있는 탑으로, 2단의 기단(基壇) 위에 3층의 탑신(塔身)을 올린 형태이다. 기단은 아래위층 모두 네 면의 모서리와 가운데에 기둥 모양을 본떠 새겼다. 각 기단의 맨윗돌은 윗면에 약한 경사가 있으며, 네 모서리의 선은 뚜렷하게 표현되어 있다. 탑신부는 몸돌과 지붕돌이 각각 하나의 돌로 이루어져 있고, 몸돌은 모서리마다 기둥 모양이 새겨져 있다. 1층 몸돌의 남쪽 면에는 길고 네모난 윤곽이 새겨져 있으나 무엇을 표현하려 하는지는 알 수가 없다. 지붕돌은 밑면에 5단씩 받침을 두었고, 윗면은 얇으며 수평을 이루는 처마선은 네 귀퉁이에서 살짝 들려 있다. 전체적으로 통일신라시대의 석탑양식이 잘 나타나 있으나, 기단의 가운데 일부 조각 등이 생략되는 것으로 미루어 보아 9세기 후반에 세워진 것으로 보인다. 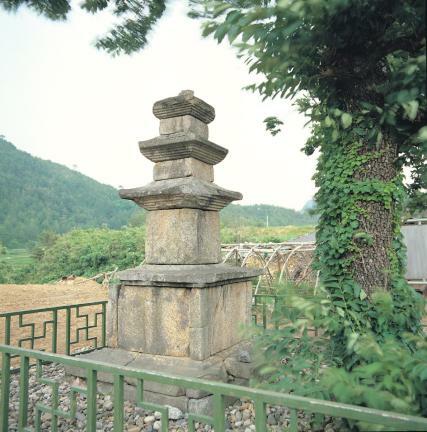 This stone pagoda located in Gusan-ri, Uljin County consists of a two-layered platform and a three-storied main body. All the four corners and facets of the two layers of the platform are engraved with pillar patterns. The top stones of each layer slope gently on their upper surfaces and have four clear angles. The core stones and roof stones of the main body are hewn from one stone each. Every corner of the core stones is carved with pillar patterns. The southern side of the core stone of the first story features a square frame though the exact intention of the design is not known. The roof stones have five-tiered cornices and their upper parts are thin and horizontal, but their eaves curve swiftly upwards at the four corners. 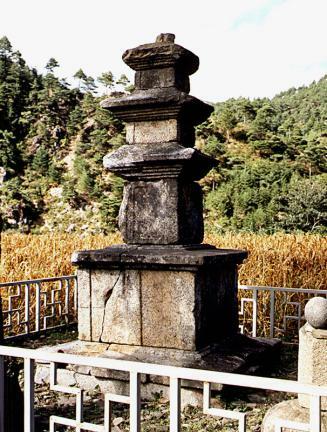 The pagoda exhibits overall the typical style of stone pagodas built during the Unified Silla Dynasty. However, judging from some unadorned parts of the platform, it is assumed that it was erected during the late ninth century.